I found and restored my car in 2001, after finding it rotting in a private garage near Cannes. The car is a lightweight model, chassis number 9/688, originally bought by Paddy Gaston in 1963 and raced by him, then John Wingfield, later Rod Longton, Paul Howard and along the way, by Gerry Marshall. better known as XPG 1, from the Wingfield days. Since renovation plus endless hours & far too much money poured into it, we have now become quite competetive, winning class in the GT Sports and Car Cup series and racing at Le Mans 24hr Classic, Nurburgring Nordschliefe, Spa, Sitvester, Donington, Dijon, Portimao and various other circuits. 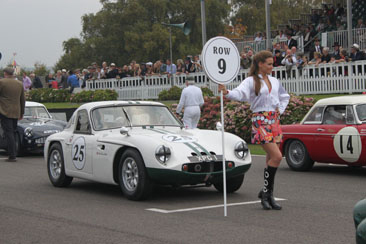 An invitation to race at the Goodwood Revival was very happily received. Click here for more on the TVR and more racing.